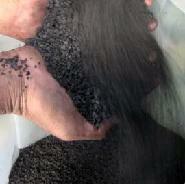 • Rubber crumb is recycled rubber from automotive and truck scrap tires. • Steel and nylon is removed. • Suitable for rubber tile, rubber mat and rubber compound.